Where else can you hear the roar of Tyrannosaurus Rex and jump into the jaws of the great white shark in complete safety except at the Tucson Children’s Museum? At the Ocean Discovery Center, children visit the Sea of Cortez while sitting in the shark jaws. In the underwater environment, kids hear whale songs, learn what fish looks like on the inside and discover which everyday products come from the sea! Emily, an eleven-year-old scuba diver, tells them about life under water. The Sea of Cortez, that body of water in the Gulf of California and its flora and fauna, are featured in the Ocean Discovery Center exhibit. While having loads of fun, kids learn about careers in oceanography and marine biology. In Dinosaur World the highlight is the robotic animation of three life-sized dinosaurs: a Tyrannosaurus Rex, a Kentrosaurus, and a Protoceratops. Their movements are orchestrated to a video giving background information about their respective behaviors and physiology. Additional exhibit components include a Deinonychus, Utahraptor and a replica fossil bed with preserved dinosaur eggs and older animal skeletal remains. 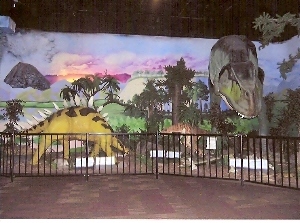 The dinosaurs represented were chosen to accurately represent size while exposing visitors to a wider range of species than just a handful of popular dinosaurs. At the Museum’s electricity exhibit during a guided group tour, guides demonstrate “hair raising” experiences with static electricity, explain safety precautions and help children understand how electricity works. Learn what Jacob’s ladder is and how to prevent a power outage. A Jacob’s ladder or a high voltage traveling arc, is a device for producing a continuous train of large sparks which rise upwards. The spark gap is formed by two wires, almost vertical but gradually diverging away from each other towards the top. At the Enchanted Rain Forest preschoolers can check out the textured tree entrance and fun hieroglyphics that lead toddlers into their own tropical rain forest play space. The Mind Your Own Body exhibit is where fun and wellness go hand in hand. Here children explore hip hop, yoga, and tai-chi classes, and practice their medical skills in the Children’s Medical Center, or do some healthy shopping in the Farmers’ Market before cooking in the Play Cafe. The Música de las Americas exhibits feature congas, drums, shakers, and xylophones. Parents take comfort in knowing that acoustic panels have been added to the room to absorb children’s musical creations. In the Public Safety exhibit, children wear a firefighter’s gear, climb into a fire truck and learn about fire safety. They can also take a “drive” in the fire truck! The Museum has a special Light Writer room where children can write with light. Don’t miss the Heat Wall, where your temperature changes the colors of the wall. Toot, toot into the Whistle Stop gallery where little engineers get behind the “wheel” of a fun-filled train engine and imagine themselves steering a locomotive. Whistle Stop passengers also get an engineer’s point of view with the on-board train camera that rolls along above the exhibit. This entry was posted on September 14, 2010 at 10:55 pm and is filed under Uncategorized. You can follow any responses to this entry through the RSS 2.0 feed. You can leave a response, or trackback from your own site. This entry makes me want to gather up my grandchildren and head for the Tucson Children’s Museum.